This is a very simplified and somewhat principled view of organizational strategy formulation – it’s a sort of cheat sheet that one uses when one is unsure about what strategy actually is. It takes us on the journey from organisational vision to strategy formulation, in the spirit of simplicity, succinctness and precision. Although good strategists who habitually create good strategy will not need this kind of memory aid, for those who have difficulty knowing their business arse from their organisational elbow, it may well help. A: This element is basically “the vision thing” the visualisation of an imagined future. The vision of where we would like to be at some point in the future, usually as a key point along a continuum and not as an end-station, how we see the future, how we see ourselves in that future, and how the future will interact with us, in all the ways that we can presently envisage. Of course, a vision can also have certain emphasis, depending on the present and the possibilities. A vision can be driven by opportunities, by desires for consolidation and base protection, consolidation and growth, or simply a graceful decline, or even, a managed fall. Visions can also be driven by eating too much pizza late at night, but that’s quite another matter. B: Challenges to the vision and the creation of a guiding policy for approaching the formulation of possible strategies. Visions are great, but they must also align to some extent with present realities and constraints, even if those present constraints are overcome. 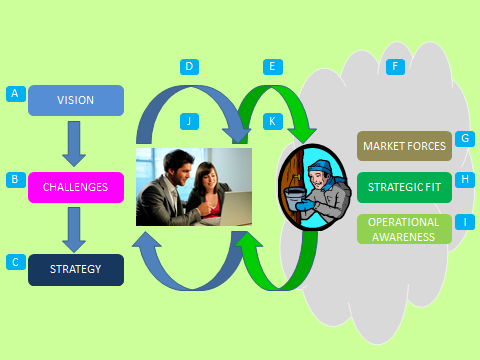 C: Strategy for overcoming the challenges and making the vision happen. This is about getting to where we want to go, and the ways of mitigating, avoiding or reframing obstacles, risks and constraints on the road to where we want to be. D: This is the top of the iterative loop in terms of hypothesising and testing visions, challenges and strategies. E: We start with and driving idea, (or maybe even a set of optional driving ideas,) and then we flesh it out and stress test it in a controlled environment, and sometimes, when time is abundantly available, that controlled environment can be power workshops where everything is questioned to the nth degree, in which answers, clarification and explanation must be open, honest and forthcoming in order for the process to work, and that applies to all aspects. F: The information demand and supply feedback loop, out of and into the iterative strategy loop. G: Identifies areas from which information is harvested in order to meet the informational requirements of the strategy formulation process. I: Data and information relative to strategic fit (abilities, arts, axioms, and attitudes, etc. or equally applicable, those elements found in McKinsey & Company’s 7S Framework). Data and information usually associated with computer systems, applications and databases that support day to day operations of an organisation. Including structured data and textual data. J: The project team charged with formulating organisational strategies. K: The notional harvester of data, information and explicit knowledge used in the process. At a high level of abstraction it is rather simple, so it is rather surprising that this simplicity is very often discarded in favour of warm, fuzzy and insipid froth.